A mystery set in an old bookstore? I’m sold! When I first stumbled upon Catriona McPherson’s new novel „Quiet Neighbors“ there were three things that immediately drew my interest and made me want to read it almost right away: 1) The setting of a story is an old bookstore full of hidden treasures and only thinking about high shelves crowded with books and imagining the smell of old pages already made me want to dive into the book and get lost in the shop, 2) it’s categorized as „suspense“ and the author is known for writing psychological thrillers, so I was intrigued by the prospect of getting to solve a mystery that is somehow connected to the bookstore, and 3) the book cover looked pretty dark with an old cottage standing next to a graveyard under angry clouds and made me hope for a twisted story with a dark and maybe even creepy atmosphere. 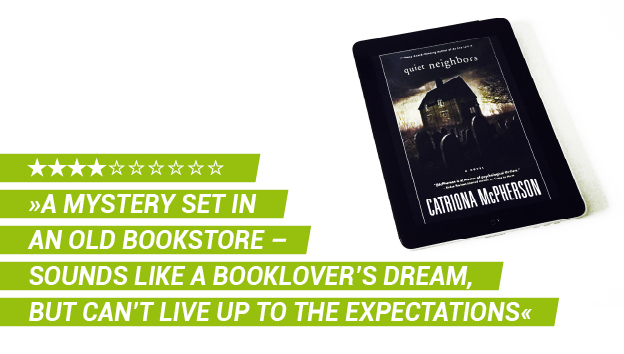 So for those reasons I had quite high hopes for „Quiet neighbors“, but unfortunately Catriona McPherson’s novel was never able to live up to my expectations. Let’s start with the setting because this part was still the best about the book in my opinion, since Lowland Glen Books turned out to be almost exactly as I had imagined it with chaotic piles of books that reached floor-to-ceiling and narrow bookshelves that make you feel as if you’re in a booklover’s paradise but also have you a little bit afraid that the stacks might fall down every moment and bury you under tons of old books – though that’s definitely not the worst death I can imagine… Unfortunately I never really got to feel the full charm of this old and chaotic bookstore because almost all the books and authors that have been mentioned in the novel have been completely unknown to me which I guess is mostly to blame on my sketchy knowledge of classical or sophisticated English fiction but on the other hand I’m also not completely uneducated when it comes to English literature and still maybe recognized only one or two names among the many mentioned titles in the story, so a big part of the bookshop’s magic was just lost on me. There were so many situations where Jude and Lowell, the two main characters in this story, were super excited when they found a special treasure among the piles of old books or happily shared their passion for some authors or classics and I was never able to tell if those were fictional and made up by Catriona McPherson or novels that actually exist. So imagine you’re in a house full of books and you don’t know a single title or author but everybody else but you is completely freaking out about them – wouldn’t you feel a bit lost, too? An even bigger disappointment was the mystery because for at least two thirds of this story I couldn’t even find one, at least none that could awaken my interest. For most of the time the biggest secret seemed to be why Jude so hastily left London and what she’s hiding from in this small Scottish village but the author barely even mentioned her past for the longest time so that she didn’t manage to build up any suspense for me. Therefore I found at least the first half of the book extremely dragging because nothing really happened and I also couldn’t really relate to the characters so that I almost completely lost interest in Jude’s story. I had hoped that Lowell as the weird and chaotic bookseller might be more interesting but he turned out to be even more boring since all he did was shouting „dear me“ over and over again and no matter what happened he was always okay with it so that it seemed as if he didn’t even have an opinion on his own. The only character that wasn’t completely flat was Lowell’s daughter Eddy who at least managed to make me laugh once or twice with her blunt behavior towards the nosy townsfolk. But what I struggled the most with was Catriona McPherson’s writing style which I can only describe as weird. I admit that I’m not a native English speaker so maybe part of the blame might be on me but I’ve already read hundreds of English books in my life but never struggled so much with the language as with this one. I often felt as if I was reading not only an Advanced Reader Copy but rather a completely uncorrected first draft because a lot of sentences didn’t even make sense to me and I often had the impression that the second part of a sentence didn’t know what the first half was about. There were so many leaps that seemed to come out of nowhere – sometimes even mid-sentence – that I was having quite a hard time understanding the story and often had to read sentences several times to make sense of them which was absolutely exhausting. I’ve never had an experience like this with a book before and it felt really weird and definitely didn’t help me enjoying this novel. I have the habit of not DNFing books that I’ve started reading but I was often very close to laying this book aside and give up and if „Quiet Neighbors“ hadn’t been an ARC I probably would have done so. Nonetheless I have to admit that the last 20% of the story then surprisingly turned out to be better than expected because there finally was a mystery – which seemed pretty far-fetched and in some parts even a bit ridiculous but at least something actually happened. However these last chapters couldn’t change my opinion about this book anymore and I’m almost a bit sad that I didn’t like „Quiet Neighbors“ because the premise had sounded quite promising. 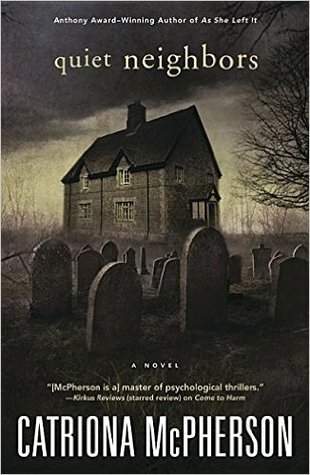 Catriona McPherson's novel "Quiet neighbors" comes with an interesting premise that sounds like a booklover's dream but instead of an exciting mystery set in a bookstore it rather provides a very dragging story with almost no suspense at all and a weird writing style that makes it quite difficult to follow the plot.